← What Would You Like To See From PsySociety? It’s not that I necessarily want to defend Marks, but it seems that most of the problem here can be attributed to one basic failure: His inability to accurately understand the perspective of a social group other than his own. He speaks about how easy it would be to access certain technology if only someone really wanted to do so, without accurately taking the perspective of a community that doesn’t exactly have the easiest time accessing those resources in the real world. As it turns out, Marks’ very status as a white, educated, middle-class man (read: Marks’ status as a inherently powerful person) might form the very basis of his perspective-taking failure. A few years ago, Adam Galinsky and colleagues conducted a series of studies examining the effect of power on one’s ability to successfully take others’ perspectives. As you might imagine, what they found wasn’t altogether that surprising. In the first task, some participants were asked to recall a time in their lives when they felt powerful, while others were instructed to recall a time when they felt powerless. They were then told to use their dominant hands to write the letter “E” on their foreheads as quickly as possible. The researchers were interested in noting which direction the participants wrote the “E”; did they write it as if it were meant for themselves to read, or as if it were meant for those around them? Powerful people were more likely to write the "E" so that people facing them could not read it. 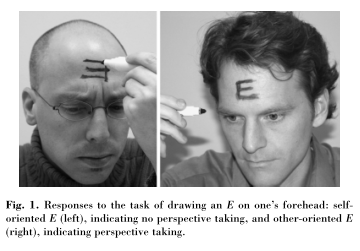 Those who were primed with power were more likely to write the “E” like the man in the picture on the left — “self-oriented.” They were less likely to write the “E” like the man on the right, who has assumed that he should write the E so that those around him can successfully read it. In other words, powerless people were more likely to successfully take other people’s perspectives into account, like the man in the picture on the right. The powerful participants, like man on the left, did not. The participants knew that clearly, this had to be sarcastic. After all, the colleague hated the restaurant. But to the uninformed friend receiving the e-mail, there should be no reason to interpret this message as anything but sincere. After all, there’s nothing in the actual message itself to suggest sarcasm. The participants then responded to the question “How do you think the colleague’s friend will interpret the comment?” on a scale of “Very Sarcastic” to “Very Sincere.” Remember, the friend receiving the e-mail had no idea what the colleague actually thought about the restaurant – only that the friend said the restaurant was “marvelous” in the e-mail. But lo and behold, the powerful participants were significantly more likely to think that the naive friend would interpret the comment as sarcastic. This wasn’t just a “sarcasm bias” either; in another version of the experiment where the colleague supposedly loved the restaurant and then wrote that it was “marvelous,” the powerful people were conversely more likely to say that the friend would interpret the comment as sincere. In other words, powerful participants were more likely to overweight the special, privileged information that they had, and they subsequently predicted how other people would (or should) respond to certain situations as if the other people had access to that same, privileged knowledge as well. To be momentarily blunt, powerful people often fail to correct for the fact that other people don’t have the same special knowledge that they do. When they think about how other people should respond to situations, they are significantly more likely to overweight the information that they happen to have (like, say, knowledge about the vast amount of educational technology that is available, assuming one knows where to look for it), and less likely to consider the fact that not everyone else has the same knowledge base. 1. Note: I am white, straight, and very well-educated. I went to a top private research university for college, and I’m at a top public research university for graduate school. Between my family and my friends, I have an incredibly well-established support system that regards the pursuit of higher education very, very highly. Aside from being female and non-Christian, I have just about every “privilege” factor in the book working in my favor, so I can’t exactly speak as a member of the community in question here either. However, that being said, I hope that my commentary on this article and subsequent debate can still be of some value. 2. The research that I discussed in this blogpost dovetails very nicely with work conducted by Michael Kraus, Ph.D. and colleagues on social class and contextual explanations. He has not only blogged about this research before, but he actually wrote another post today applying it to this very same Forbes article. I’ve linked to the post below, and highly recommend it. 3. In addition to Michael Kraus’s blog post above, there are several other blog posts and articles on this topic that are well worth reading. For more responses to this Forbes article, I recommend reading the following. If you have written a response to this article and I have missed it, please leave a link in the comments below! If I Were A Middle-Aged White Man. Dear Black Kids, You Need to Work Harder! But Women Will Never Succeed! If I were a wealthy white suburbanite. ETA: Since posting this last night, two other great posts about this have come to my attention! This entry was posted in News/Current Events, Power, Social Psychology, Stereotypes and Prejudice and tagged Commentary, Groups, Norton, Power, Racism, Social Cognition, Stereotypes. Bookmark the permalink. I’ve only taken an introduction to psychology, but that second study sounds remarkably similar to Theory of Mind experiments done with very young children. Good eye! That’s pretty much exactly what this is.